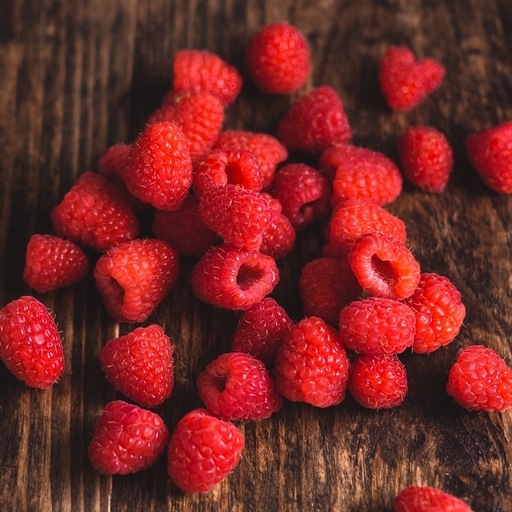 There are few things more sublime than a bowlful of plump British raspberries. We choose varieties including Miravilla, Autumn Bliss and Joan; delicate and fragrant, with a mouth-watering blend of sharp and sweet flavours. Fold through thick double cream and sweet, crunchy meringue to set them off just right. For a stunning pudding to feed a crowd, try this chocolate pavlova with raspberries. It goes down a storm in our Field Kitchen restaurant. Best eaten raw with cream, meringues or ice cream. Can be made into jam or used in cakes and desserts. Don’t forget to order your organic double cream to set them off. Keep in fridge – they only last a day or two. Bring to room temperature before eating and wash very lightly and carefully so as not to damage. Delivered fresh from the farm, so wash before eating. Summer raspberries fruit in July, autumn varieties fruit from August to October. Raspberries come in two guises: the more common summer fruiting varieties (such as Glen Ample, Glen Magna and Glen Moy) grow their cane one year and flower and bear fruit the next, allowing them to crop in July, whereas autumn fruiting varieties (such as Autumn Bliss and Joan) send up cane, flower and fruit in the same season and hence fruit later (August to October).